The Bradford Rattlers have ended their 2014-2015 campaign -- falling in a tough 5 game series with the Toronto Blue Ice Jets three games to two. This comes just in the first round of the Russell Cup Playoffs. Stepping up huge in the playoffs was Swedish forward Sebastian Hoglund. Sebastian had 8 points (3g, 5a) to lead the team in playoff points. Mikko Lindbom had 5 goals while Rasmus Brunnberg had 4 goals of his own in the first round. Although it was a much earlier end to the season than expected, the Rattlers group leave with their heads held high after a very successful season. Many players on the team have received NCAA and Pro interest and will be moving onto higher levels. A good group of Rattlers will also be returning next season. "We had a pretty special group here", said Head Coach Sylvain Cloutier, "this was my first year with the Rattlers and I was blessed to coach these young men. It has been a great experience." 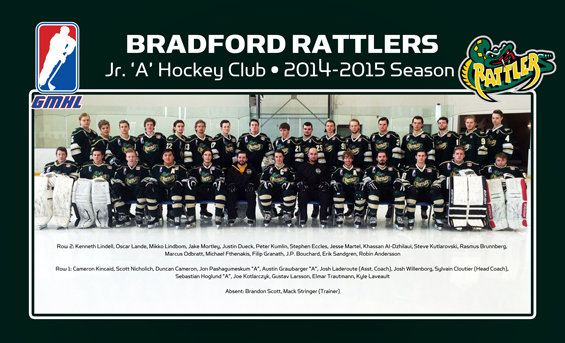 The Rattlers now turn their heads to next season -- recruiting players and the GMHL Entry Draft taking place in May. Stay tuned to www.rattlershockey.ca for all the updates through the offseason.